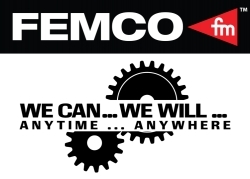 Pittsburgh, PA, March 18, 2019 --(PR.com)-- FEMCO HOLDINGS, LLC, a leading national machine repair and manufacturing company, announced today that it has acquired ELMCO Engineering, Inc., an Indianapolis, Indiana based company. ELMCO Engineering is a leading manufacturer and repair facility for powdered metal compacting presses. ELMCO Engineering has served the worldwide powdered metal market for 28 years as a leading manufacturer of new and rebuilt powdered metal compacting presses, including an extensive parts inventory. In addition, the company repairs and services all makes of presses. With an extensive customer base, located throughout the Midwest region, ELMCO Engineering expands FEMCO’s footprint to seven full service repair and manufacturing facilities located throughout the United States. Doug Marshall of FEMCO at (480) 646-6534 or e-mail at dmarshall@femcomachine.com.